In 2009, ninety-one former state attorneys general filed a friend of the court brief supporting Siegelman's appeal to the Supreme Court. They argued, "clear legal standards are required to protect individuals from politically-motivated prosecutions based on conduct that is ingrained in our campaign finance system and has always been considered legal." That's a discrete way of saying Siegelman's prosecution and conviction was politically motivated. Why are former Republican and Democratic attorneys general, top prosecutors, sending petitions of outrage about Siegelman's prosecutors? Has this ever happened before? 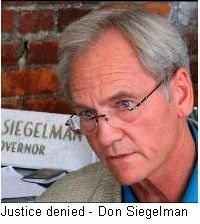 A review of the history and facts of the Siegelman case shows that through her support of the Siegelman prosecution, Elena Kagan is entirely unacceptable for any court concerned with the rule of law or the dispensation of justice. Then Governor Don Siegelman sought his second term as Alabama's governor in 2002. He'd run a credible administration as Alabama's first Democratic governor in eight years. His opponent, Republican Bob Riley, represented the hopes of their party to restore dominance in Alabama. At the end of election night, Siegelman retained his office by just 3200 votes. But local officials found a "computer glitch" that when corrected took 6300 votes away from Siegelman. The result was changed and Riley barely won the popular vote. The never demonstrated claim was that computerized memory devices used in optical scanner voting machines had malfunctioned. When Siegelman demanded a recount of the optical scan forms used to generate the vote tally, the request was denied by then Republican Attorney General William Pryor. A recount would have been simple. Just tally the votes as marked on the optical scanner forms. But voting officials refused Siegelman's recount request, citing the state attorney general's advice that a recount would be illegal. Bob Riley was installed as governor. Two years later, then Alabama Attorney General William Pryor received a recess appointment to the federal bench by George W. Bush. Some time in 2001, Leura Canary, U.S. Attorney for Alabama's central district, began investigating Alabama politicians. Canary was (and remains) the wife of longtime Republican strategist Bill Canary, a close associate of Karl Rove, who helped build Rove's career. In 2004, he was indicted in an Alabama federal court for bid rigging. One day into the trial, the prosecution dropped the case. It was dismissed "with prejudice," meaning that Siegelman could never be indicted again for the same charges. The presiding judge, U.W. Clemon, would later say that the prosecution was "the most unfounded criminal case over which I presided in my entire judicial career." Clemon also accused prosecutors of misconduct and urged an investigation. Siegelman continued his quest for a second term hoping to win the Democratic primary for a rematch with Bob Riley. He'd obviously ignored the wishes of the other side to stay down. One of those on the other side was Bill Canary, the "king maker" of Alabama Republican politics. In October 2005, as the Democratic primary was shaping up, Siegelman was again indicted, this time on multiple counts including racketeering and granting political favors in return for contributions. The most prominent charge involved HealthSouth Chief Executive Officer, Richard Scrushy. The executive contributed $500,000 to a foundation that had promoted a state lottery to fund public education. Scrushy was later appointed to a nonpaying position on the state hospital board. Siegelman did not benefit personally nor did his campaign fund, which was separate from the foundation. Scrushy had been appointed to the same board previously by Republican governor to whom he'd contributed. The charges came from the office of U.S. Attorney Leura Canary who said she'd recused her self due to conflict of interest early on in the investigation. Evidence released in 2009 demonstrated that Canary had ongoing input to the Siegelman prosecution long after her formal withdrawal in 2002. This included emails on legal strategy. One recommendation was that prosecutors obtain a gag order to stop Siegelman from talking about the case in public. At trial, a new actor emerged center stage, federal Judge Mark E. Fuller. Fuller owned the controlling interest of a private firm that received nearly $260 million in defense contracts from the Bush administration from 2002 through June 2007. In February 2006, two months before the trial began, presiding judge Fuller's company was awarded a $178 million multiyear defense contract. Despite the obvious conflict of interest, the judge denied any problem and presided over the trial, which began May 1, 2006. The Siegelman trial lasted nearly two months. He was found not guilty on most charges but guilty for a "quid pro quo" in appointing CEO Scrushy to the hospital board. The U.S. Attorney prosecuting the case somehow missed this fact: "over 100 people who raised more than $100,000 for George W. Bush’s campaign ended up with government jobs." The trial jury was deadlocked for a time but ultimately came in with a guilty verdict on seven of the thirty two charges. Rather than the 45-day grace period prior to prison offered to federal defendants, Siegelman was manacled in court and sent off to jail immediately after sentencing. Arizona Attorney General Grant Woods, a Republican, said he'd never seen a judge do that. But Siegelman was special. He was a real threat to the control of Alabama, an exclusive Republican fiefdom. Under pressure, the Obama Justice Department investigated the Siegelman case. Justice chose to let members of the prosecution team, political appointees form the previous administration, conduct the review. Those accused of perpetrating a massive injustice behaved predictably. They exonerated themselves. Then, when Siegelman appealed his case to the Supreme Court in 2009, President Obama's Attorney General dispatched Solicitor General Elena Kagan to argue against the appeal in November. Before accepting the case, Elena Kagan knew or should have known: that the U.S. Attorney who began the Siegelman investigation was closely tied to Karl Rove; that Siegelman never benefited personally from the contribution to an education funding initiative; that the case was so outrageous, forty-four attorneys general petitioned Congress; and, that the presiding judge in the case owned a major interest in a defense firm that received a $178 million federal contract between Siegelman's indictment and trial, a massive conflict of interest. Most revealing, before her argument against the former governor's appeal, Kagan knew or should have known the following. After two charges had been dropped in a 2009 appeal, Justice Department attorneys recommended a twenty year sentence instead of the seven years already rendered. Fewer offenses for sentencing meant thirteen additional years by the strange logic of federal justice. Kagan knew or should have known all this and more. That didn't stop her from arguing that Don Siegelman should be kept in jail. Without any doubt, Kagan knew that her position as U.S. Solicitor General was voluntary; that she could simply refuse to argue for a further miscarriage of justice. Kagan knew what she was doing when she argued against Don Siegelman's appeal. She did it of her own free will. Therefore, she deserves a judgment based on her actions. That judgment is that Elena Kagan was a willing accomplice in one of the most outrageous political prosecutions of our time. Why should anyone ever trust her? Her nomination to the Supreme Court of the United States should be rejected unanimously. N.B. Leura Canary continues to serve as the U.S. Attorney, Middle District, Alabama. Many thanks to Joan Brunwasser for her helpful comments. I have to say that you've done a worthy argument against her judgement, with this story, in my opinion.